When Thomas Roelofson (1825-1897) was six-months old, his mother Mary, went back to her old home in Kentucky for a visit. She traveled by horseback alone, except for the baby, Thomas, whom she carried before her on the saddle, guiding the horse with her free hand. 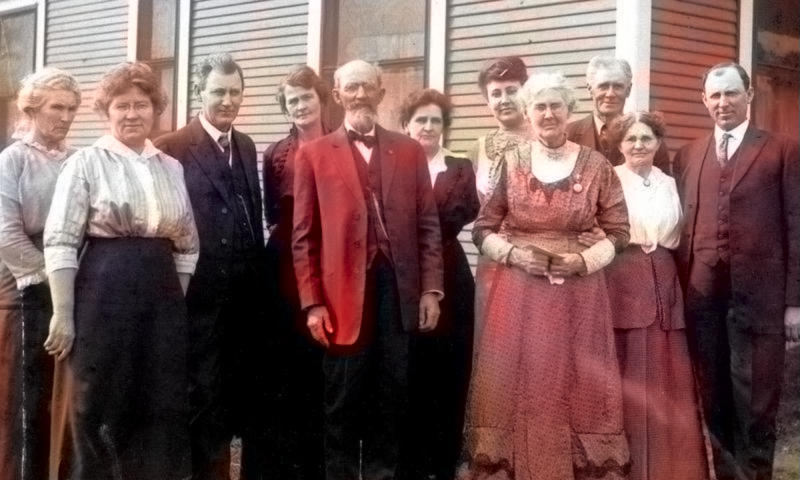 Lawrence’s home was always open to ministers. At the time of the Meteoric Shower (in 1832), a number of neighbors flocked to his house in fear. About 1835, Mary, climbing a fence with a bundle of yarn she was taking to a loom to be woven, fell and broke her right leg just above the ankle, and was bitten on the leg by a sow, which became infected and would not heal. She was bedfast, suffering great and constant pain for about 7 years. Gangrene finally made amputation necessary. The operation was performed at the hands of an unskilled doctor and crude instruments, no anesthetic. Three operations were performed before it would heal. Young Thomas witnessed his mother’s agony and vowed revenge on the Doctor when he grew up, but the doctor died before he could carry out his threat. Mary was described as of low stature, blue eyes, and of light complexion and red hair. She loved her home, used crutches when walking any distance after her injury. She did her housework with leg resting on a chair, which she shoved along so she could have it handy when she stopped. The best information of the Lee family is that three brothers came from Normandy, France, with William the Conqueror in the year 1066. Their Norman name was DeLei and was Anglicized Lee. Intervening history is too lengthy for recital in this paper. Joseph Lee, related to the Revolutionary Lees, was born in Cape May County, New Jersey, about 1781. When some 30 years of age he married Amy Lunbeck. In 1817 with their first child Jonathan Johnson Lee they moved to Pike county, Ohio, where were born Nicholas, Richard, Joseph Dunn Bradford and several daughters. When I was ten years old, we lived for about a year in a little log cabin in Polk County, near where Fort Sheridan stood. Ever since we had been in Oregon, we had lived in Salem, and had near neighbors with children to play with me. This was a lonesome place, no houses in sight and no near neighbors. As told to Elsie Odell Bennette by Beth Gowdy. Bellpassi was a little town, that was moved to be by the railroad and its name changed to Woodburn. 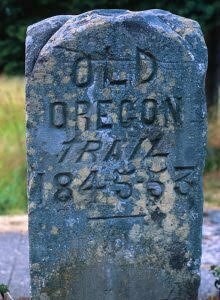 Before that Mr. Brown had the station for the stage stops between Oregon and California. Mrs. Brown cooked for the passengers. The horses were changed there and my father cared for them, and made trips back and forth to Portland. As told to Elsie Odell Bennette by Beth Gowdy about John Tucker Gowdy on the Oregon Trail in 1852. Your great grandfather, John T. Gowdy, was only seventeen years old when he crossed the plains in 1852 by ox team. By the time he was telling this story to his children, he had forgotten the name of this river.